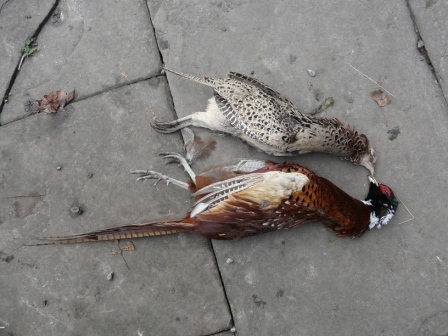 Being presented with a brace of freshly murdered pheasants is initially so exciting – free food! 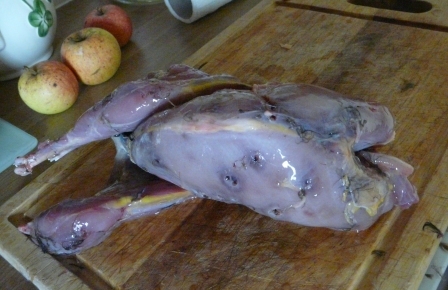 And better still, I don’t have to do anything about it while they hang for a few days in the larder. A few days stretches to a week. Ten days pass. Joy turns to dread as I realise I must either face plucking and gutting the corpses or put them straight into the bin. I attempted an easy-peel solution which involved standing on the wings and pulling it up by the legs. This looked easy on youtube, but I just managed to pull the wings off. 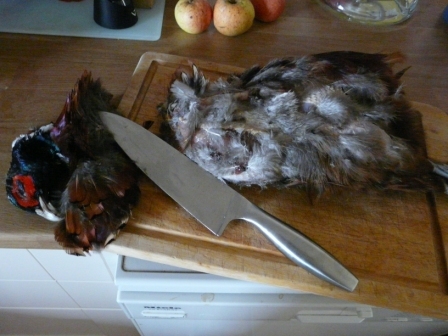 So I had to resort to a knife, chopping board and kitchen full of feathers. Chopping off the head and pulling out the tail feathers was relatively straightforward. Following more online advice I cut around the legs and pulled the feet and tendons out. It was easiest to take off the skin rather than scatter any more feathers around the room. I was quite pleased with my efforts at this point and it had only taken about 45 minutes. But hang on – there’s something I’ve forgotten – a bellyful of guts that need to be removed. All the advice suggests this is a simple endeavour, and actually it’s not too bad. Just imagine you’re on ‘I’m a Celebrity’ and enduring some kind of jungle trial which will actually result in your eating a meal. 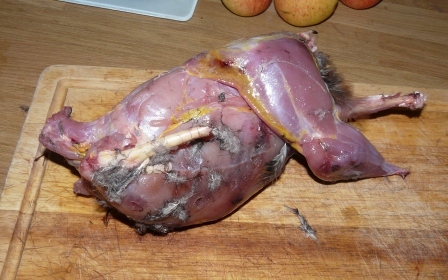 I put my hand up the end of the bird and just scooped the innards out with two fingers, then dived back in for more. 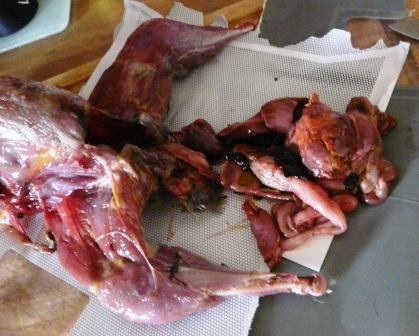 After a week of hanging I wasn’t game to cook up the offal. The envelope I had used as an extra layer of protection wrapped the guts up neatly. Here’s the bird at the point I felt happy it was oven-ready. Now there’s just the small matter of trying to cook it into something edible. I also had some concerns about the amount of shot I was going to find inside as it had been well and truly blasted. 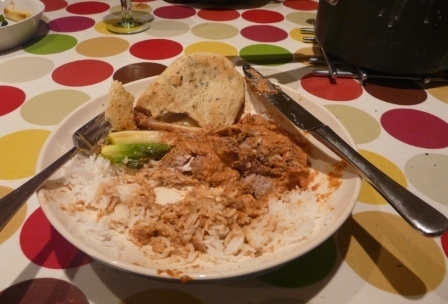 So rather than roast it, I jointed it and marinaded it overnight to make Hugh’s pheasant makhani. I’m pleased to report that it was absolutely delicious and will be my first port of call next time I’m lucky enough to be given pheasants. The other bird went into a more traditional ‘coq au vin’ style casserole and lurks in the freezer until I’m feeling “game” to eat it.